My sons 3Po and Jammy seem to be entering an extremely physical stage in their development. They've always been live wires, running around 24/7, but now that they've entered kindergarten they're on the go with their friends -- and sometimes they end up punching each other. Alfie says it's nothing to worry about, and he's probably right, but we both agree that we want to limit their exposure to violence in the media. That's why I appreciate fantasy games like Ubisoft's Battle of Giants series for Nintendo DS -- they recognize that boys are very physically oriented and like to act out power struggles in their pretend and fantasy play, but they don't depict humans fighting and killing each other. The characters in these games clearly belong in the fantasy realm, so my boys are clear about pretend and real. If I'm going to let my boys play a videogame, I'd rather have one of dragons fighting rather than real people! 3Po and Jammy already enjoy the Dragons and Dinosaurs games, and now that Ubisoft kindly sent us a copy of the latest Battle of Giants game: Mutant Insects, they have even more avenues for fantasy play. Like the previous two, Mutant Insects allows the boys to create characters -- in this case, mutant insects like scorpions, spiders and praying mantises -- and put them into battle with each other. The more they play, the more they can build their insect's special powers and attributes. In a far distant future, a gigantic asteroid went out of orbit and collided with Earth. This terrible catastrophe left only ruins in its wake, forever changing Earth’s landscape….and its inhabitants. Insects, the most adaptable form of life on Earth, have mutated to transform into massive giants and become the new rulers of the planet. As one of four mutated insects, travel through the barely recognizable lands while battling gigantic enemies to find the source of the mutation. Your goal? Become the strongest mutant insect on the planet and survive the chaos! Now that the boys can read, it's less frustrating for them since the game requires players to read simple instructions. They're really been enjoying this game, and I have even seen them take the mutant insects theme into their pretend-play sessions with plastic insect figurines! 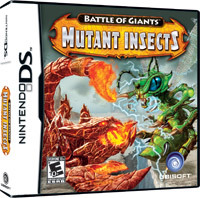 One lucky winner will receive a copy of Battle of Giants: Mutant Insects for Nintendo DS, courtesy of Ubisoft. Leave a comment on this post and tell me which insects you -- or your bloodthirsty sons :) -- would most like to see in battle. This entry must be completed before extra entries qualify. 3) Become a fan of Bonggamom Finds on Facebook (1 entry). This giveaway ends at midnight PST on June 5, 2010; I will draw a winner at random on June 6 and post the winner's name after the winner confirms acceptance. For additional giveaway rules, click here. Good luck! Disclosure: I received a product sample, but was not paid to review the product or give my opinions. Unless clearly stated, the views and opinions expressed here are my own. My son love spiders...this is right up his alley! So gross! Button is on my blog. I'd love to see the battle between the spider and the flying ant. I subscribe via email, which is where I heard about this contest. I follow your blog via Blogger/GFC. My son and myself would love to see Cockroaches and Spiders battle each other. Facebook fan of Bonggamom Finds as Darla Kidder. I follow on Google Friends Connect as LUCKYLADY42. I wrote on Ubisoft's Facebook wall. My son has a dislike of grass hoppers and that would be his choice. We'd like to see dragonflies in battle. Thanks. Mutant Bedbugs the size of horses! I won't sleep for a week. Twitter follower ky2here1, please follow back if you can. My son would love to see fighting Preying Mantises. My son would say ants. We were watching a program about them the other day, it said they were one of the few species that actually go to war with each other. They are really vicous fighters. I would like to see wasps and bees fight it out. Ear wigs creep me out and would be great at doing battle. My daughter is bug nut! She would like to battle mosquitos. My sons would love this game. They are terrified of bee's, so I'd go with that. Thanks so much. I'm a subscriber. Thanks so much. Praying mantis gets the vote. Definately Praying Mantis and perhaps a Walking Stick. I'd like to see wasps and bees in battle... and I'd like to see them be destroyed! I hate them things lol. My son would like spiders and ants. How about grasshoppers and the praying mantis!!! We would like to see Dragonflies. I think they should include a praying mantis. They look kind of creepy not-mutated! Technically they are not insects, but my grandson said he would like to see scorpions fight. Mosquitos because they are so annoying that it would be a joy to shoot them up. My son says, spiders would be fun in battle. Evil Grasshoppers would be cool in battle, lol. I liked you on Facebook, thank you. I am following you on Blogger. I posted it on UbiSoft's Facebook Other's wall, thank you. A Scorpion would be cool. My daughter absolutely HATES spiders - so that would be her choice. Praying Mantis would be my choice. Since my son hates ants, he's love to see them go head to head! For us it would be ROACHES! My daughter hates ants but loves snakes. Black Widow Spider Vs House Fly. The flying ants and the cockroaches should battle it out!